The brain absorbs a lot of useless information every day. Things like the number-plate of the car in front of you, or a conversation you overheard on the side of the road. Most of that info isn’t needed, and the brain naturally forgets it along with a lot of useful information. High school students are humans too so all of this applies to them. So how much do you actually remember? A German psychologist named Ebbinghaus decided to do an interesting experiment. He created a list of 2300 made-up words and tried to personally memorise them, while repeatedly testing himself at various time intervals. Evidently he was a man who knew how to make the most of his free time. Figure 1: The how-bad-you-are-at-remembering-stuff curve. 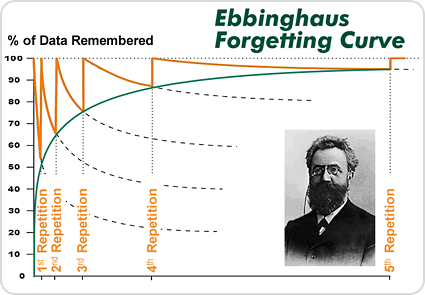 Aka the forgetting curve. This is called the forgetting curve. It decreases very quickly initially, and decreases slower with time. The exact curve depends on a lot of factors, such as how meaningful the information is and how stressed you are, but the shape remains the same. If the graph looks like it's going down really quickly, just keep in mind that this is for an adult who is trying really hard to remember. It's worse for a high school student who's actively trying to forget everything the moment school is over. What you may have noticed is that after the revision (or repetition) the next day, the new curve has changed – it decreases a lot slower. You forget slower. And yes, if you do enough repetitions, you’ll have near perfect recall. The time you revise the material is important. For best results, the first repetition should take place very soon after the initial learning, and each repetition after that should take place after a long and longer interval. In the graph above, the repetitions are shown with the orange line, while the dotted line shows what happens if the next repetition does not occur. The green line shows the minimum amount of information remembered as you do more and more repetitions. This stabilises at around 95% with 5 repetitions. That’s right – if you do five repetitions correctly, you’ll permanently remember 95% of the information. This is called spaced repetition learning. When many students get home from school, they don't really want to look over what they just learned that day. The first time they'll encounter it again is when they are doing the homework a few days later. That's the first mistake - they don't get the full benefit of spaced repetition since they leave the first repetition too late. A week later, the teacher has moved onto the next topic and there's suddenly something else to learn. The student doesn't look at the material again until maybe 3 weeks later, when they're studying for a test. After the test, they don't look at it for months until the exam or assessment. That's the theme here - they're missing the ideal times to consolidate their knowledge so when they do revise they're not getting the full benefit. Instead of gradually changing the forgetting curve so that more knowledge is permanently retained, it's almost as if they're learning it again from scratch - and forgetting it just as fast. Often students will complain that they don't have time to do so much revision, but it actually saves a mountain of time. You can spend 15 minutes after school reviewing something that's fresh in your mind, or you can ignore it and spend an hour re-learning it a week later. Additionally, if it takes you 15 minutes to review something the first time, it might only take you 5 minutes the second time as your information becomes more consolidated in your brain. This corresponds with the forgetting curve getting shallower, and with you permanently retaining more knowledge. Private tutoring can be a great help when it comes to this - the lessons help students to get more repetitions in the areas that they need. Importantly, confusion and misunderstandings can be addressed early on before they become entrenched. Memory is definitely not an exact science, so focus more on the general idea behind this article and not so much on the details. And maybe your kids will learn how to remember 95% of what they absorb at school. Here’s the original article by Hermann Ebbinghaus for those interested.